For many walkers, this seems like an out of reach place, with rock on all sides acting as huge bastions. Without rock climbing skills and equipment it is indeed a 'no-go' zone, for the exposure and situation alone demand a huge amount of respect, this is a serious place. A Birkett, a Nuttall, and is no doubt a feature of various other tick lists. And this draws much attention to an otherwise far away lump of rock. And what a lump of rock it is, massive and standing proud from the mountainside, this place is awe inspiring, beautiful, and dramatic. 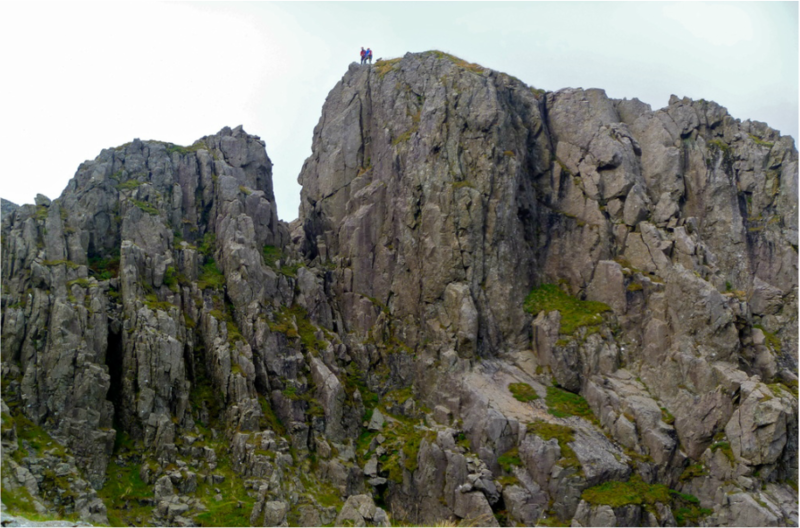 The only way to reach the true summit of High Man is to follow a rock climbing route, the easiest being 'Slab and Notch' at grade Moderate. On a calm and dry day this is quite an easy proposition, even for a non-climber. But add in a little dampness on the rock and a breath of wind and things start to feel somewhat more 'interesting'. After enjoying the climb and of course the stunning views from the summit, the way back down is a 15 metres abseil into Jordan gap, followed by either a scramble to the top of Pisgah, or a down climb to the start of the Slab and Notch route. Should you decide to hire us as guides for your ascent, we of course take care of all the technical aspects and provide all technical equipment, leaving you to fully enjoy the Pillar Rock experience. Situated high above the Ennerdale valley in a commanding position. Access is via either Gatesgarth in Buttermere, or Wasdale Head. Our recommendation is to start at Buttermere and walk in via Scarth Gap and the Memorial Bridge of the River Liza. The approach walk takes around 2 hours 30 minutes. To improve the experience (if indeed that's possible), why not stay the night at Black Sail YHA, this allows for a far more leisurely walk in. We can arrange to meet clients there too. An itinerary could look something like this, but is flexible to individual requirements. We meet around 9am at Gatesgarth Farm in Buttermere, from here we issue equipment and begin the walk. Allowing between 2.5 - 3 hours to arrive at Pillar, the pace needs to be steady but not fast. 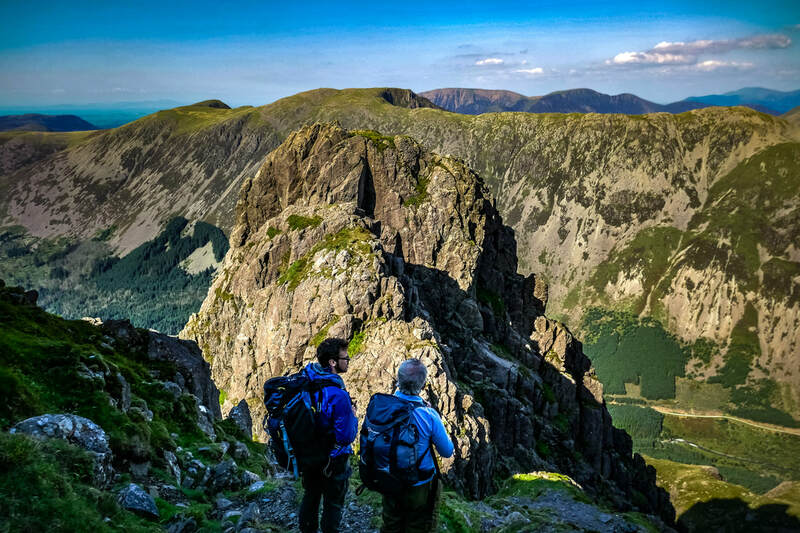 After crossing the River Liza in Ennerdale the ascent becomes very steep, the crags of Pillar will already be in view and the scale of the rock soon becomes clear. We will likely climb without our backpacks (leaving these by Pisgah for collection later). After getting kitted out with helmet & harness, we begin the roped climb of Slab and Notch route. This is around 60 metres in length and is naturally split into a number of sections. The climbing is mostly straightforward but is incredibly exposed, so a head for heights will be an advantage. Hopefully we will enjoy amazing views from the summit before an abseil is set up for our descent into Jordan Gap. The abseil is around 15 metres, and whilst no experience is necessary as we'll take care of all the technical aspects, some prior experience will be helpful and make your day more enjoyable. From Jordan Gap we will give you the choice to either follow a grade 3 scramble to the summit of Pisgah, or we continue descending to arrive at the base of the climbing route (whichever option is taken we stay roped until back at the base). Once back at the bags, we can take off all the climbing equipment and head for home, arriving back at Gatesgarth somewhere around 6pm, having summited the rockiest of Lakelands peaks.